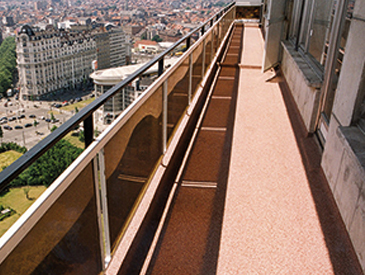 Most balconies and walkways are constructed from concrete with an asphalt waterproofing membrane, and without any protection these substrates will inevitably crack and erode. We can offer a range of systems specifically designed to protect balconies and walkways against the challenges presented by the elements. The systems incorporate a waterproofing membrane over a suitable primer. They would normally utilise a moisture-triggered curing system. Our balcony systems can be installed over most existing surfaces, eliminating the costs and inconvenience associated with breaking out and disposing of the old material. And depending upon your design demands, a range of functional top-coat options are available.